Geographically the second tallest (north-south) state east of the Mississippi (after Florida), Illinois is dominated by massive urban and suburban expansion in the north, fertile prairies in the central part of the state, and more rugged landscapes of the southern tip. The Mississippi River forms the western border with Iowa and Missouri, and the Ohio River forms the southern boundary with Kentucky. Originally part of the Northwest Territories, Illinois Territory was established on February 3rd, 1809. 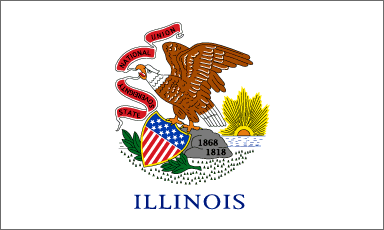 Less than 10 years later, on December 3rd 1818, Illinois became the 21st state to join the Union. Illinois is known as the 'Land of Lincoln' since Abraham Lincoln spent much of his adult life in Springfield, the capital (though he was actually born in Kentucky). Chicago began as a town of 350 people on the banks of Lake Michigan in 1833, but went through a massive urban boom over the next 100 years, owed largely to its ideal geographical position, waterway routes, and the development of its rail connections. In 1871, the Great Chicago Fire burned most of the city to the ground, though the rebuilding afterward helped Chicago became an influential metropolis and architectural gem where the world's first skyscraper was raised in 1885. Just under a quarter of the population of Illinois lives in Chicago, though over 65% of the population lives in what is known as 'Chicagoland', the metropolitan expanse that includes cities as far away as Rockford. 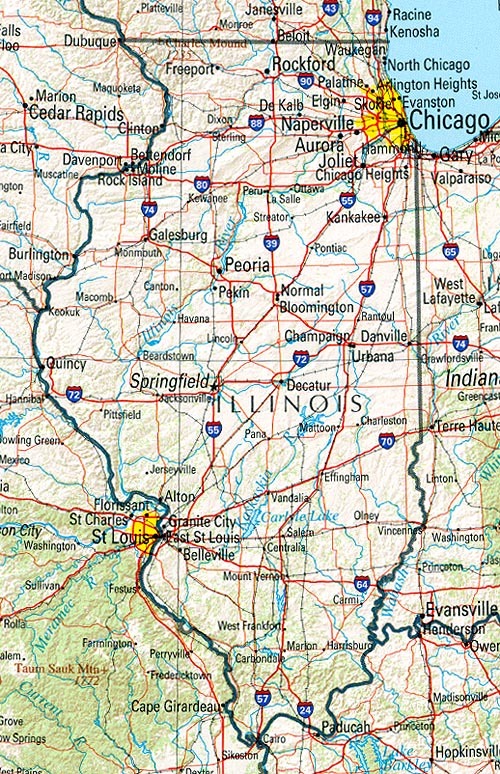 Other major urban areas include 'Metro-East', the Illinois side of the Greater St. Louis Metropolitan Area, as well as the central urban areas of Champaign-Urbana, Bloomington-Normal, and Peoria. The gross state product of Illinois is approximately $528 billion (2004), which is 5th in the nation. Coincidentally, the state's population is also 5th in the U.S. Manufacturing in the Chicago area makes up a significant portion of the economy, with world-leading industries in metal fabrication, electronic and transportation equipment, chemical products and machinery, as well as home to one of the publishing capitals of the world. This tremendous output of industry, as well as the giant expanse of Greater Chicago, is mostly why the area is dubbed 'the broad shoulders of America'. Agriculture is also an important economic earner, with corn, soybean, hogs and cattle leading the way. Illinois is considered a swing state, with the majority of Democratic Party voters residing in the cities. Suburban Chicago was traditionally a GOP stronghold, but is fast shifting toward the left. The consequences of this shift might best explain the recent success of the Democratic Party in Illinois, which has won the state's 21 electoral votes in the last 4 presidential elections, including an 11 percentage point margin for John Kerry in 2004. 11th November 2010	 Illinois is awesome. I am doing this state for a geography presentation and there is so much information to put on this state.